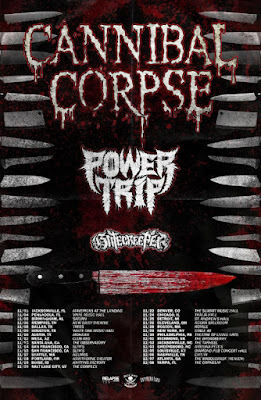 CANNIBAL CORPSE will kick off their US headlining tour in support of their upcoming "Red Before Black" full-length next week. 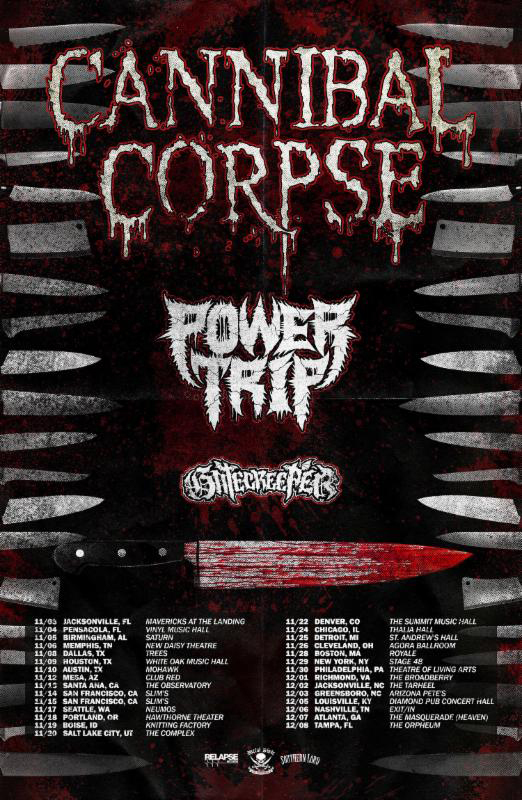 The tour will commence on Nov. 3 and run through Dec. 8 with support provided by Power Trip and Gatecreeper. Many words come to mind when you hear the name CANNIBAL CORPSE, but one truly defines the soon-to-be thirty-year death metal veterans: Unstoppable. Produced by Erik Rutan (Hate Eternal, Goatwhore), "Red Before Black," the band's fourteenth album, serves to not only reiterate this but to once more raise the stakes, making it very clear who sets the standard when it comes to always compelling music that is equally brutal and complex. Moreover, the band have pushed themselves again, ensuring that it stands out from their catalog. "Throughout our career we've tried to improve the precision of both our musical execution and our album production, while still maintaining full-on aggression. 'Red Before Black' continues in that direction, but might go even further on the aggressive side of things," bassist Alex Webster said. "It's definitely precise, but it has a rawness to it that goes beyond anything we've done recently." "We really worked super hard crafting these songs, practicing them, and getting them where we wanted to be more so than on any of our previous albums," drummer Paul Mazurkiewicz said. "And as Alex said, musically I think it's the rawest sound we've had - and at the same time I think it's our most focused, tightest and catchiest record." "Red Before Black" will see release on November 3rd via Metal Blade Records. Preorder bundles are currently available at metalblade.com/cannibalcorpse where you can also preview the title track as well as the band's video for "Code Of The Slashers."